We are a Federal Firearms Licensed Dealer in North Carolina. We pawn, buy and sell rifles, shotguns, pistols, revolvers and more. Need cash? 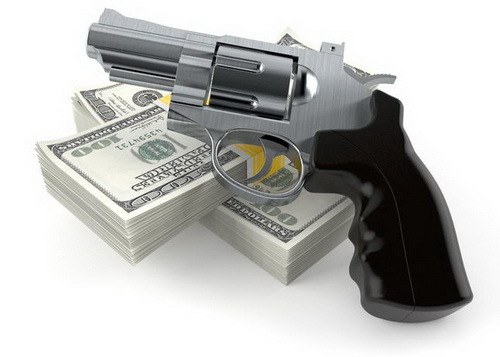 Get a loan on your firearm. Bring it to Picasso Pawn and we will be happy to assign a borrowing/collateral value for your firearm and you can borrow up to that amount of money. The process is quick and easy and you walk out with cash knowing that your firearm is safe and sound until you come back to pick it up. While we do not display guns in our stores, we do accept them for loans and purchases. We list all firearms on Gunbroker. Visit our Online Store page to see our Gunbroker listings. Please note that a person redeeming a firearm from pawn is subject to the same federal firearm transfer laws as someone buying one. This includes a background check by the FBI�s NICS center or a permit as required by law to purchase one. Guns are highly regulated by the ATF (Bureau of Alcohol, Tobacco and Firearms). We comply with all North Carolina and Federal regulations. Visit any Picasso Pawn location in Durham, Raleigh and Wilmington, North Carolina today and receive premium customer service from our knowledgeable and professional staff!